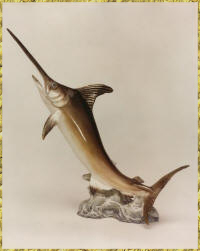 This series of twelve porcelain gamefish was sculpted for the International Game Fish Association and produced by the Franklin Mint. Each piece is also available in either .999 sterling silver or bronze. Mr. Obara produced a set in bisque (unglazed porcelain) as artist's proofs for his own collection.